If you’re thinking about remodeling your home, you should put a lot of thought and planning into your decision. Maybe you decided to buy a home that you knew would need some work, or maybe you’ve lived in your home for years and it’s time for an update. Regardless of the circumstances, there are certain questions that you should ask yourself before you begin to plan your home renovation. Here at River Woodcraft, we specialize in high-end remodeling, and we’d love to help you with your remodeling plans. If you’re curious about the type of questions you should be asking yourself before you begin your remodel, keep reading! #1. What rooms would you like to have renovated? You may think that renovating one room won’t affect the other rooms in your home, but you could be wrong. If you currently have a closed-off kitchen and you plan to tear down a wall, you may way to consider what the adjoining room is going to look like after the renovation. You may want to plan for updates in more rooms than one if you think that the renovation you’re planning could cause some inconsistencies in design in your home. Maybe you know that you’ll have to take one room at a time, and you’re okay with that. Ultimately, this decision can be answered based on what will work best for your current timeline and budget. #2. How much money would you like to spend? Speaking of budget, determining an exact budget is key when you begin your plans for a renovation. Home renovations almost always result in added expenses, so don’t allot all of your money for design elements and features for the room you’re remodeling. Plan to keep some of the money you have for the renovation in an emergency reserve for when the inevitable surprise comes up. #3. What will the primary use be for the room you’re remodeling? This may seem like a silly question if you’re thinking about remodeling your kitchen or bathroom. However, some people like to use their kitchens more-so for entertaining than they actually like to use it for cooking. If your kitchen is going to be used for entertainment, a large island and seating will be essential, whereas, if you’re primarily going to be cooking, maybe you’d like to consider the type of oven and cooktop you’re going to get. If you’d only like to use your bathroom for obvious reasons, added features might not matter to you, whereas, if you’d like to create a spa-like atmosphere, you’re probably going to be more interested in a large tub and possibly a fireplace. #4. Do you have a particular design style in mind? In order to find the right material to use in the room you’re remodeling, it’s important to know if you’d like to create a traditional, modern, or contemporary space. While it can work to mix and match styles, you’ll have to be intentional about it if you don’t want to end up with a design that doesn’t flow well. #5. What kind of storage do you need? Is one of the main reasons you’re choosing to remodel because you’re lacking the storage space you need in your current space? Custom cabinets are a great solution to ensure you’ll get the design and functionality you need from your cabinets. To determine the type of cabinets and storage you need, ask yourself if you’re willing to get rid of some of your belongings or if you’d like to have room to add more things in the future. 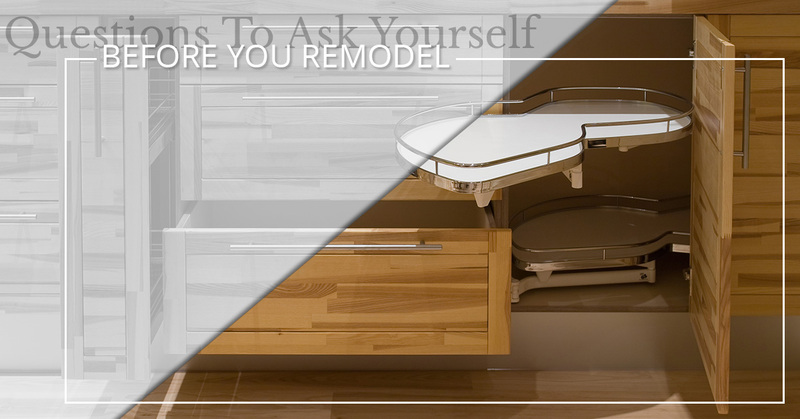 Once you’ve asked yourself these questions, River Woodcraft can help you with your renovation by offering the custom cabinets and high-end remodeling you’ve been dreaming of. Contact us today to learn more!